What's the point of traveling to another country if you're not going to test the limits of your stomach and try some street food? The Mo and I have traveled to many "developing" countries and one of the things we love to do is try the street food carts. 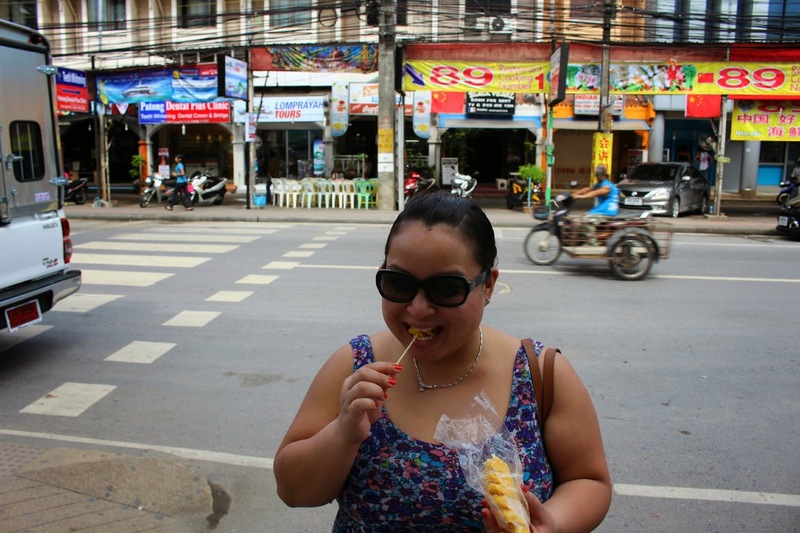 Yes, we've regretted a handful of times, one occurrence from me eating corn on the cob with pork and Coconut milk at the Russian market and the Mo in another region, both in Cambodia. 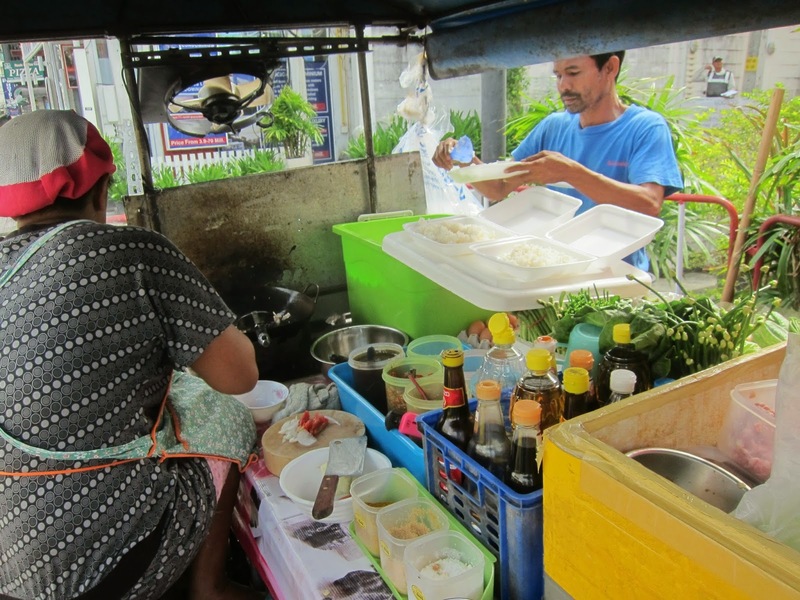 There's a handful of fried noodle carts in the Patong area. The going rate is about 100 THB which is about $ 3.00 USD. You have a choice of noodles and meat/seafood. 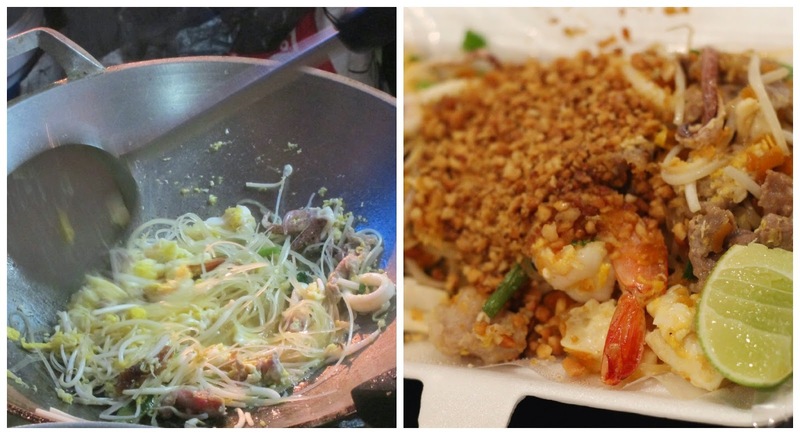 The most popular combination would be the skinny pad thai rice noodles with chicken. 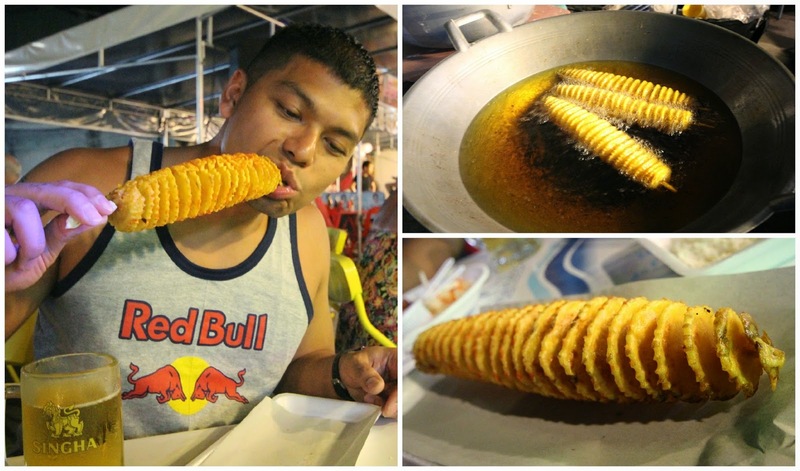 It's pretty much the staple food in Thailand for most tourists. I also like the wide rice noodles with Thai Basil aka "Phad Kee Mao." ** Note that the food court charges double, 200 THB for the same portion size. Once the sun goes down and the weather is cool and pleasant, nothing beats a bowl of noodle soup. 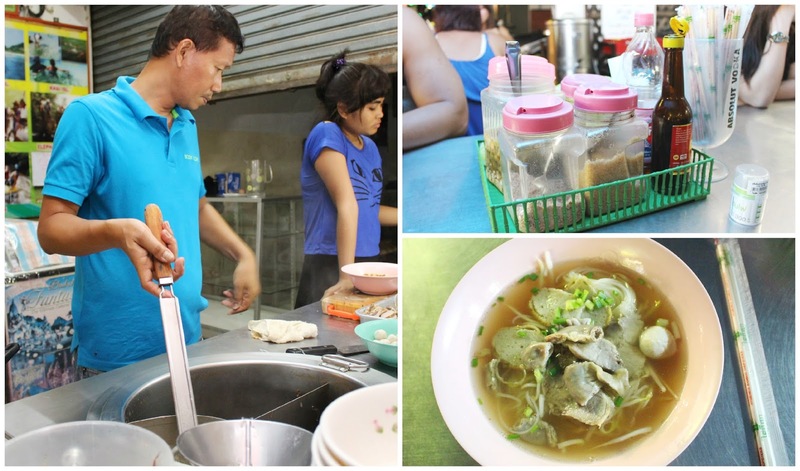 The soup is served with sliced pork, pork intestines and fish balls. We didn't realize this and next time we will ask them to nix the intestines. I love Kao boon, but this noodle dish is served in 3 individual bags. One for the soup base, one for the noodles and one for the vegetable mixture. It's a bit hard to eat on the street but if you have bowls at your apartment, then it will be fine. Some ladies do have disposable bowls for you to take away. Some even have real bowls that wait for you to consume the food and take it back. Usually the coconut noodle soup dish is served on foot from woven baskets or a motorbike. These carts are less fancy. 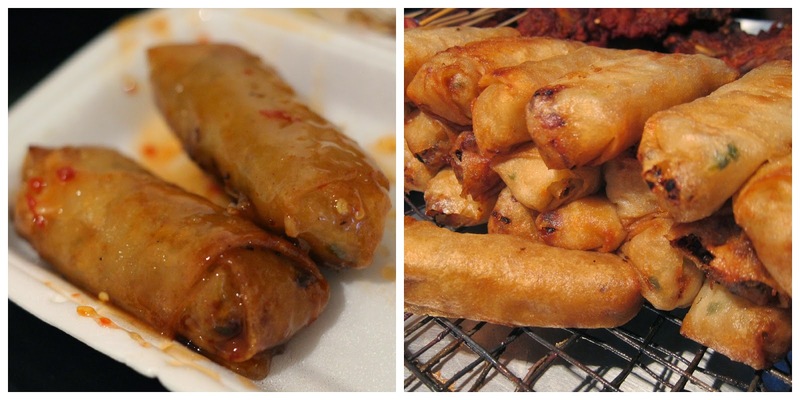 I have yet to see any pork based eggrolls. 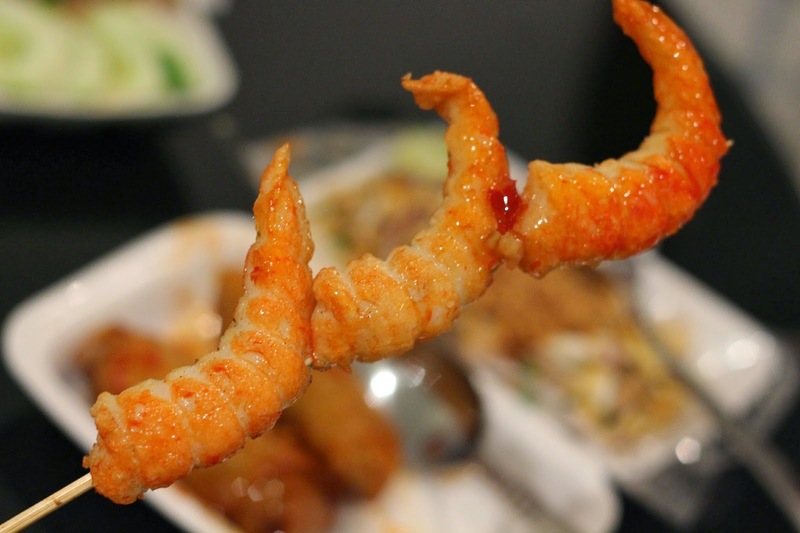 These fried delights will set you back 20 THB (60 cents USD) which is a bit more than the states. They are definitely on the greasy side because they are double fried, once before they set up shop and another time when you place the order. 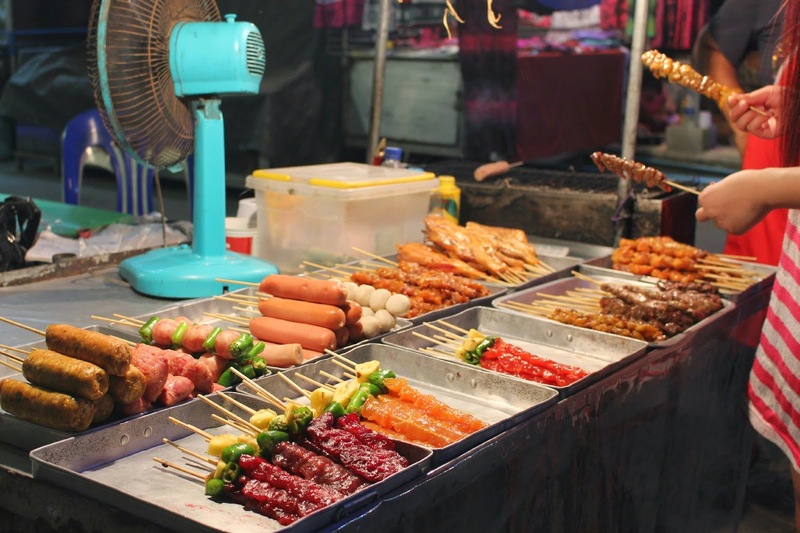 There are different carts of grilled meats ranging from your basic fish ball skewer to your grilled BBQ chicken with fried chicken feet. The basic fish ball starts around 10 THB (30 cents) and the bigger chicken breast skewer is around 50 THB ($ 1.50 USD) Just like KFC, the price of fried chicken depends on the section of the chicken. 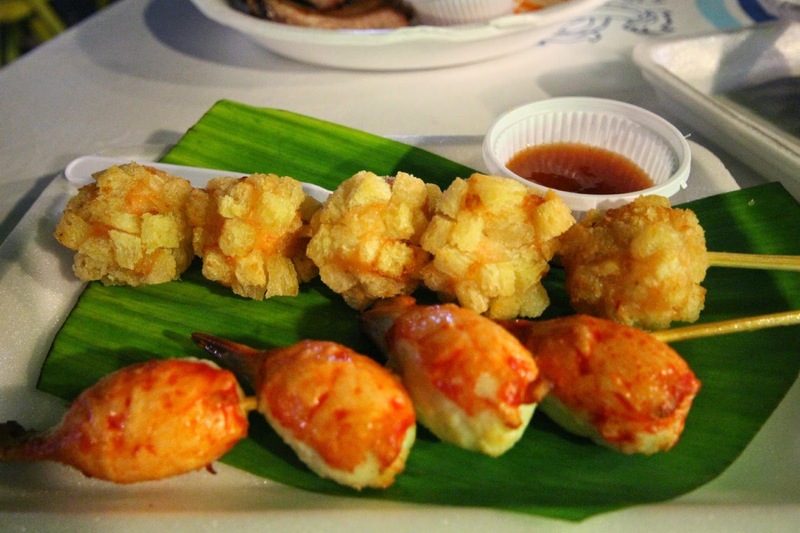 There's imitation crab balls, shrimp formed to look like actual shrimp and fish cakes. Although its pretty tasty, they aren't real and they definitely taste fake. 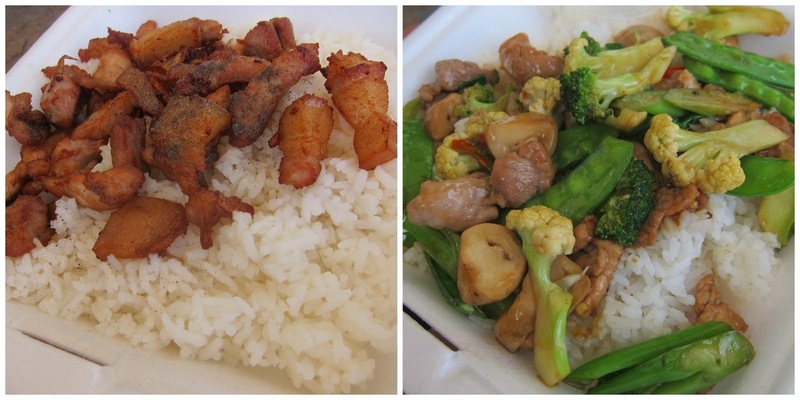 You can get fried rice with chicken or pork or white rice with a chicken or pork entree. The meals are packed in white to go foam containers along with a packet of fish and chili sauce and a spoon for convenience. These vendors are very popular with the local workers. The below was a husband and wife team on the corner of Jungceylon Mall. The Mo got a crispy black pepper pork dish and I got a mixed vegetable pork stir fry. Hygiene may be an issue as the man was handling the money, packaging, white rice and raw meat. 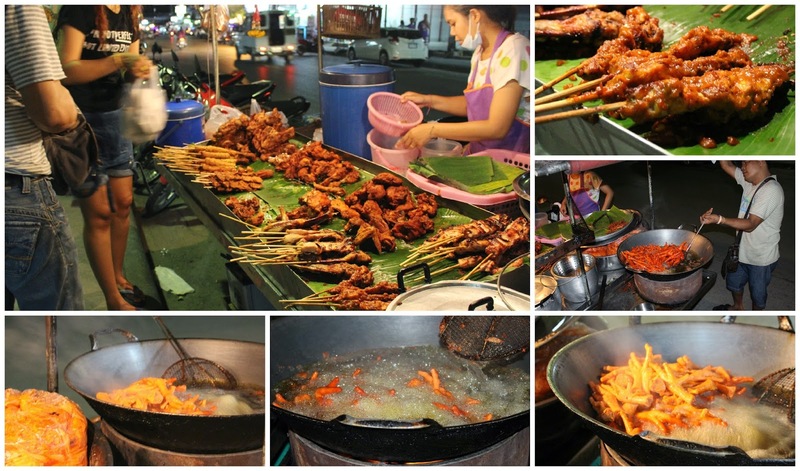 The below was a late night food cart by Bangla Road. There's a fresh fruit truck on almost every corner of the street. Most of them have your typical mango, pineapple and watermelon. There are few carts with exotic tropical fruits like durian, logan, rambutan and papaya. Look for a vendor that chills the fruit. Thirsty? How about washing it all down with a fruit shake? There's many of varieties of fresh juices with no ice or added sugar or water or a fresh fruit shake with any tropical fruit your heart desires. 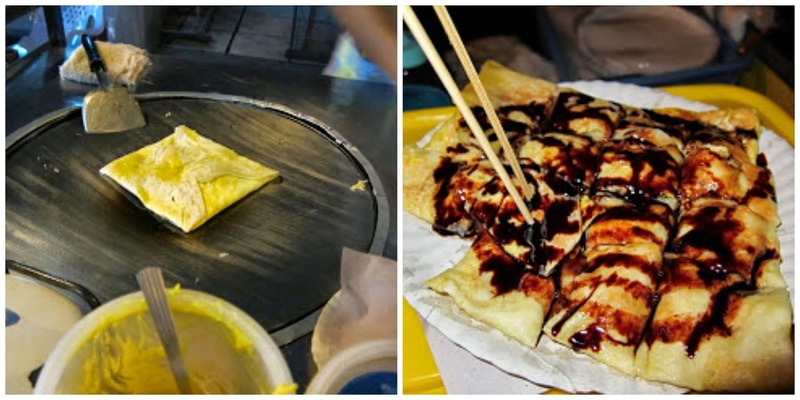 The Banana Pancake was the first thing I've ever eaten in Thailand 3 years ago and I still love it. Prices range based on what filling you want and where the cart is located. Typically around Bangla around the pancake will run you about 40-60 THB ($ 1.25 - $ 2.00) for the regular banana pancake and less $ once you are further away. Your filling choice also affects prices so if you add nutella, be prepared to add 10 THB. Mango and sweet sticky rice is also another popular street food dessert in Thailand. Prices ranges from 20-60 THB depending on how nice the cart is. Sometimes there's no cart, it's just a woman on the street with woven baskets hung on a stick. These stands are geared to the local workers. Many workers grab food to go and eat it on the run or bring it to work. For 40-60 bahts, you can pick 2 dishes for breakfast or lunch. I have yet to see any stands around dinner time. The meal comes with white rice and a small spoon. 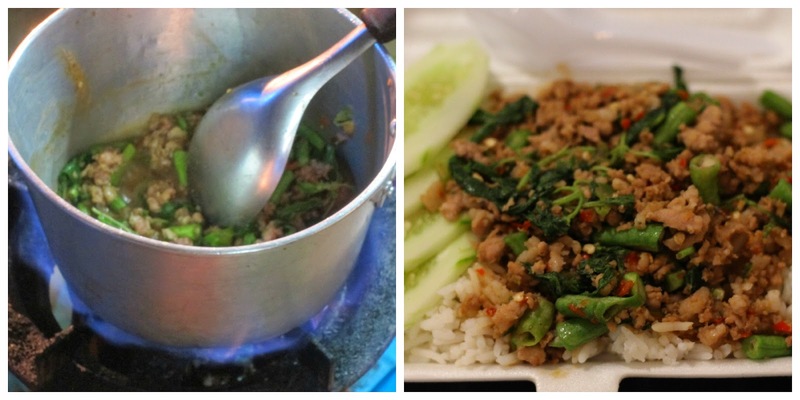 The Mo got spicy "prahok" pork and curry beef. This is not your typical salad station with romaine, iceberg, etc. 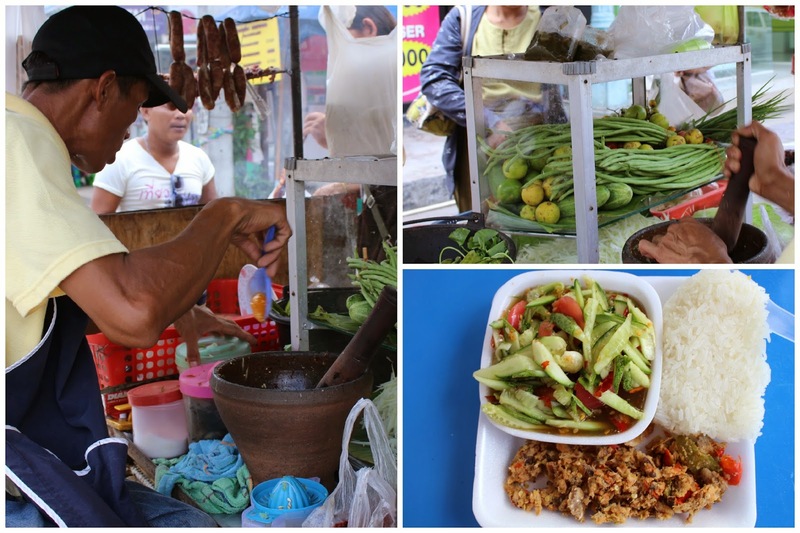 These made to order Thai salad stations specialize in the local traditions of papaya salad, green bean salad and cucumber salad. All of the above entail garlic, lots of Thai chil, fish sauce and lime. I got cucumber salad, dried fish with chili mixture and sticky rice for 80 THB. Now the food court is a different playing field. 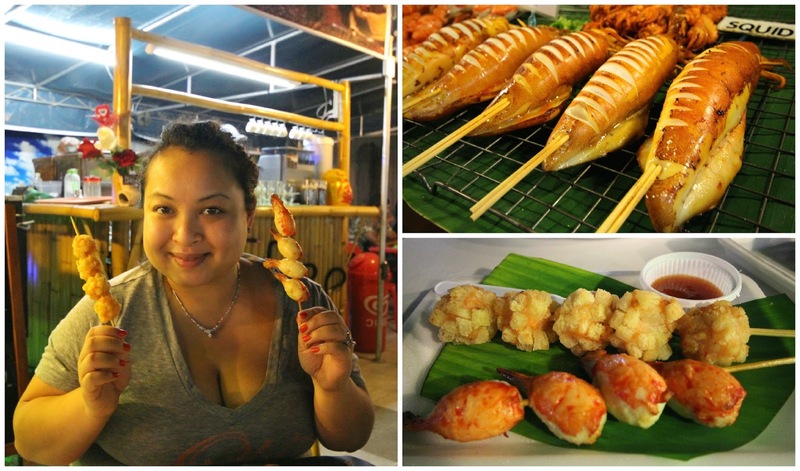 We found the "Everyday" Food and Drink Festival right off beach road in Patong. 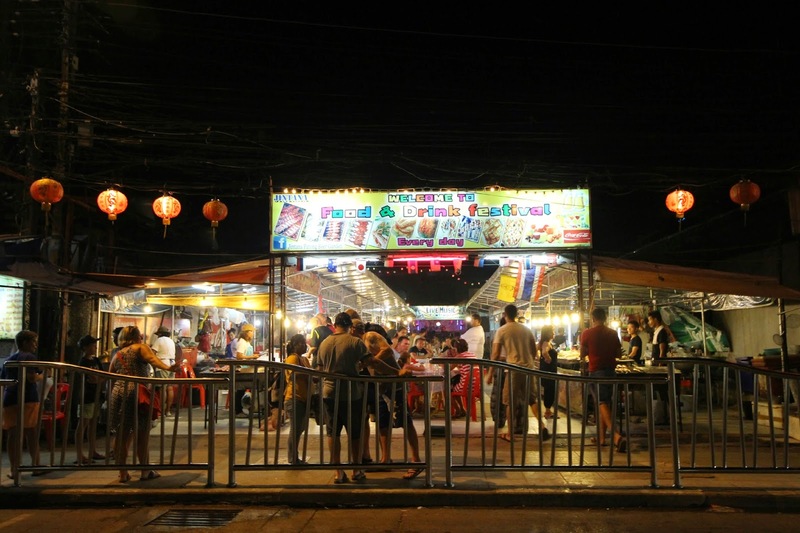 Prices are higher than the average street food prices but still less expensive than restaurant prices in most cases. None of the booths overlap and each booth has its own theme to grilled food, fried food, rice noodles, BBQ pork, etc. The food court features live music that plays covers in the al fresco seating area. While we were there, fireworks was also displayed. No outside food or beverage is permitted. I guess you can say that you pay premium prices for the ambiance. The clientele was all tourists, mostly western. 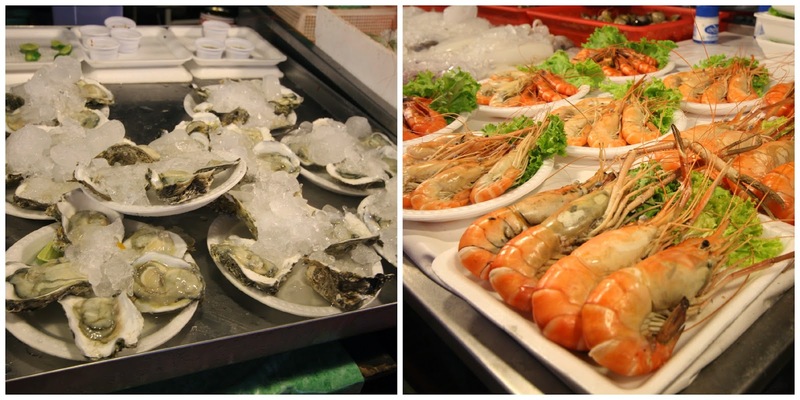 I could have gone for some oysters on the half shell but since it's served raw, I didn't want to take my chances with food poisoning. 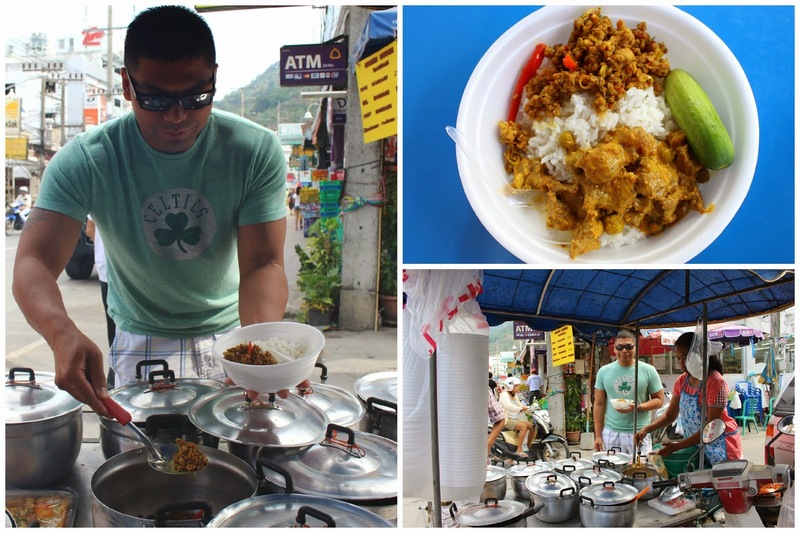 Stay tuned for Street Foods in Koh Samui and Koh Phangan!